Foliage: Irregular, gnarled trunks. Leaves alternate, elliptical, 2"-5", thick, leathery, smooth, shiny, dark green. Flowering time: Flowers late May to late June. Fruits late August through autumn. Habitat: Sandy ground everywhere except in the Cape May peninsula. 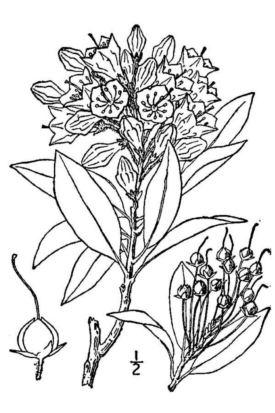 Stone says common in both dry and moist situations; an abundant plant in the Pine Barrens. Misc. 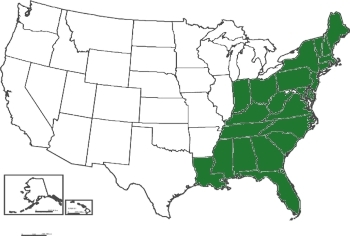 USDA lists as a facultative upland species; i.e., Usually occurs in non-wetlands (estimated probability 67%-99%), but occasionally found on wetlands (estimated probability 1%-33%). 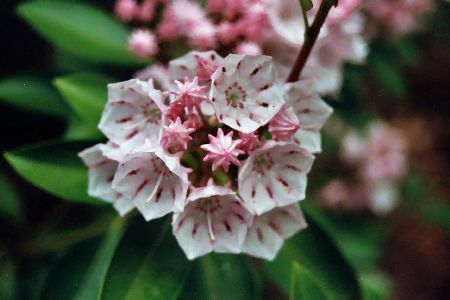 Kalmia, named for Pehr Kalm, 18th century Swedish naturalist traveling in Canada; latifolia = wide leaves.